DH is one of the common complaints frequently encountered in dental practice due to various reasons like Dental caries, periodontal disease etc. Wasting diseases that cause DH may be due to abnormal tooth brushing or heavy occlusal forces which require interdisciplinary management. Patients undergoing orthodontic treatment, crown preparation for FPD also regularly experience DH which again requires interdisciplinary management. Dentine hypersensitivity (DH) is an abnormal response of the exposed vital dentine to various stimuli. DH has reported to show a higher rate of prevalence and is witnessed to be one of the most frequent complaints encountered among dental patients. Both the genders are affected equally; however, due to increase in awareness among the population regarding the preservation of dentition, the prevalence of DH is liable to amplify in coming years. Gingival recession, wasting diseases, periodontal treatment such as scaling, root planing, and also improper tooth brushing are considered to be the main etiology of DH, that is characterized by sharp, localized pain of short duration. Brannstrom's hydrodynamic theory of DH, the most widely accepted among various theories, suggests that certain external stimuli can cause a movement of fluids within the dentinal tubules, resulting in stimulation of nerve endings within the tubules subsequently causing pain. 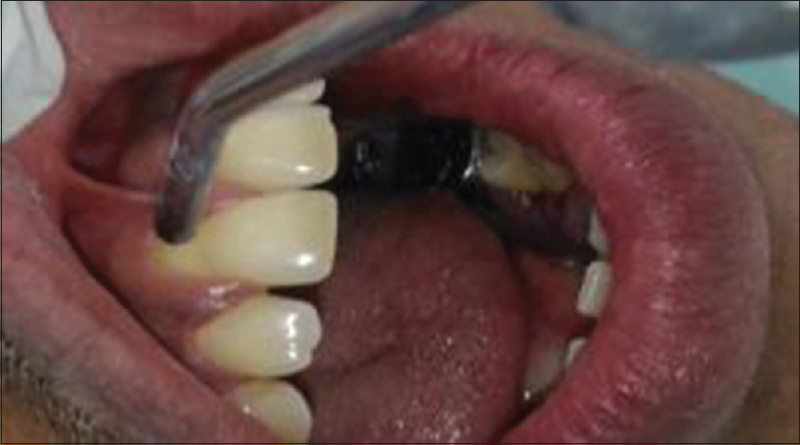 Therefore, it is understood that any materials or techniques that reduces dentinal fluid movement should decrease DH. Lasers, on the other hand, reduce DH through coagulation and protein precipitation of the plasma in the dentinal fluid or by alteration of the nerve fiber activity. Various lasers used are Nd: YAG, Er: YAG, CO2, and diode. Although various studies addressed the safety of using lasers, it carries its own disadvantages such as high cost and complexity of use. Hence, the aim of the present study is to compare the efficacy of fluoride varnish (FV) with diode laser (DL) in the management of DH. The research protocol was initially submitted to Ethical Committee of D APM R V Dental College, Bangalore. After the approval of Ethical Committee, patients were selected from the Outpatient Department of Periodontology with the complaint of Dentinal Hypersensitivity. 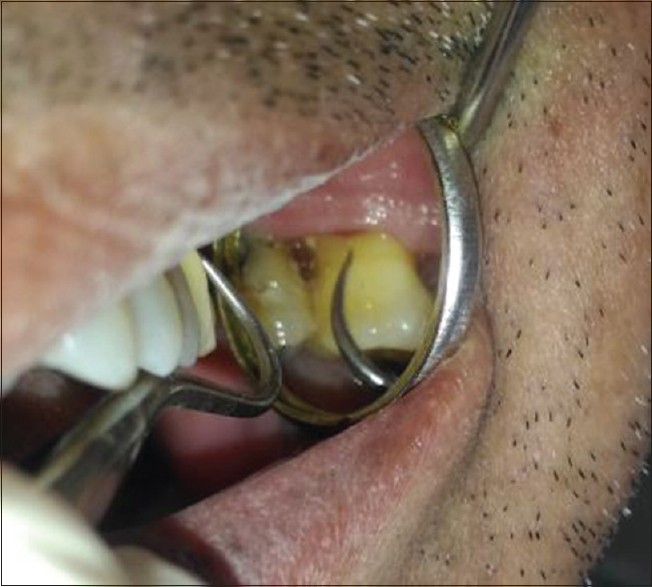 Patients with gingival recession were also included in the study, but in the absence of pathologies such as caries, fractures, wasting diseases, deep periodontal pockets as they require more definitive treatment. 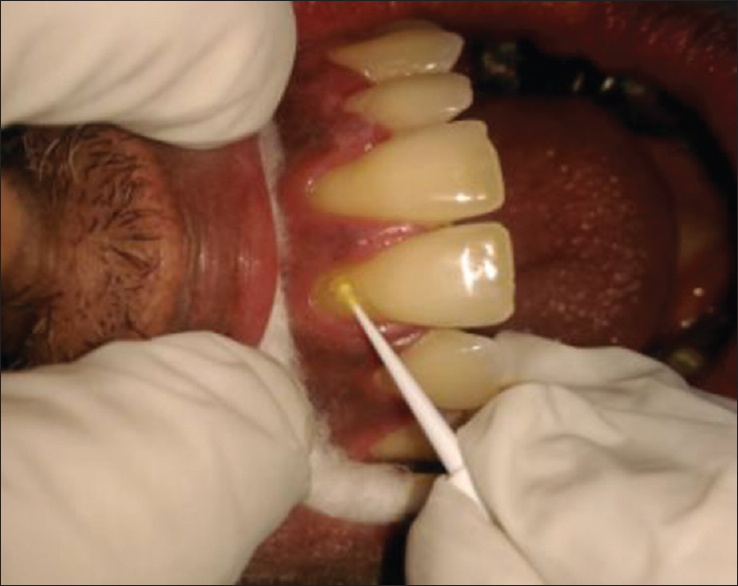 After patients were enrolled into the study, oral prophylaxis (Scaling) was performed, since the presence of local deposits might hamper the effectiveness of desensitizing therapy. Root planing is not performed in any of the patients since there might be a chance of increase in sensitivity. Absence of contraindications to the proposed therapies (e.g., allergies to desensitizing agents). Any wasting diseases such as abrasion and attrition. Forty teeth were selected from 17 patients and ensured that the patients who were enrolled in the study did not undergo any professional periodontal therapy in the past 6 months. The nature of the study was explained verbally in a language comprehensible to the patient, information sheet was given, and consent was obtained from every patient. 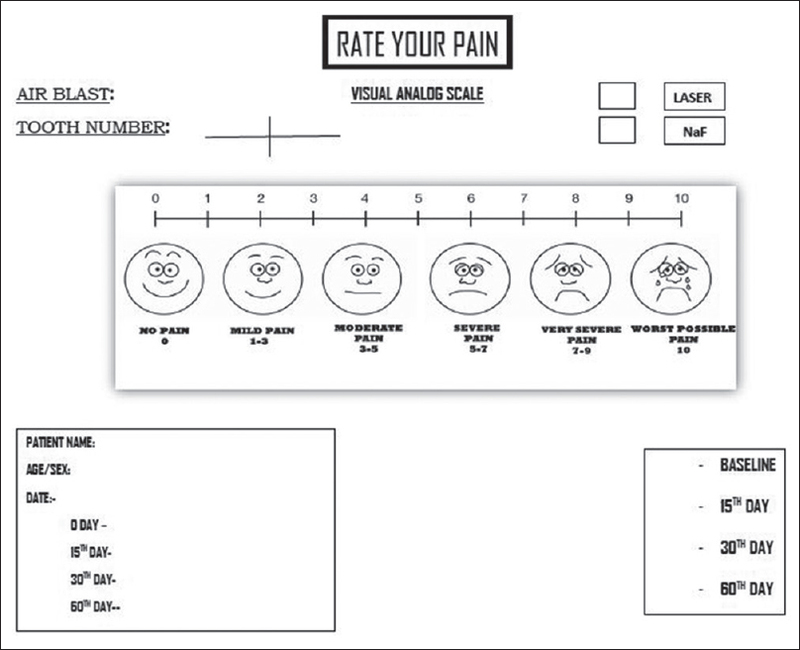 Patients then were asked to record their overall sensitivity by marking a point on a 10 cm VAS, anchored at each end by the phrases “no pain” (0) and “worst possible pain” (10) [Figure 4]. Patients then were randomly divided into 2 groups. Group I (n = 20): Those to be treated with DLs. Group II (n = 20): Those to be treated with FV. Patients in Group I received irradiation with DL beam of 980 nm wavelength, 320-micrometer core diameter optic fiber with 0.5 W output power, which was directed perpendicularly to the exposed tooth surface. Each area was irradiated for 30 s [Figure 5] and [Figure 6]. The other 20 sensitive teeth in Group II received a thin film of Flour protector varnish (Flour protector by Ivoclar Vivadent), painted on the surface with a disposable micro brush as per the manufacturer's instructions. Two-three coats of varnish were applied on the same day, and cotton roll was used to isolate the tooth surface to prevent contamination with saliva. Patients were restricted from taking any carbonated drinks or food for 1 h following varnish application [Figure 7] and [Figure 8]. Both groups were assessed for DH using VAS at baseline, 15, 30, and 60 days after the initial therapy. 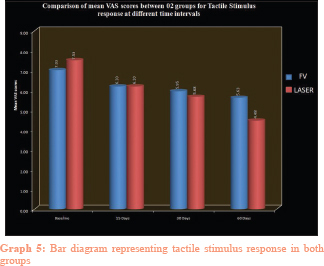 Comparison between mean VAS scores between FV and laser for Air Blast and tactile response at different time intervals were assessed using Independent Student t-test. 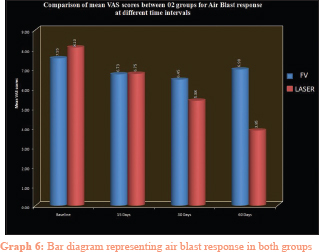 Comparison between mean VAS scores for air blast and tactile response between different time intervals in each group were assessed using ANOVA. Level of significance; P > 0.05 was considered statistically significant. 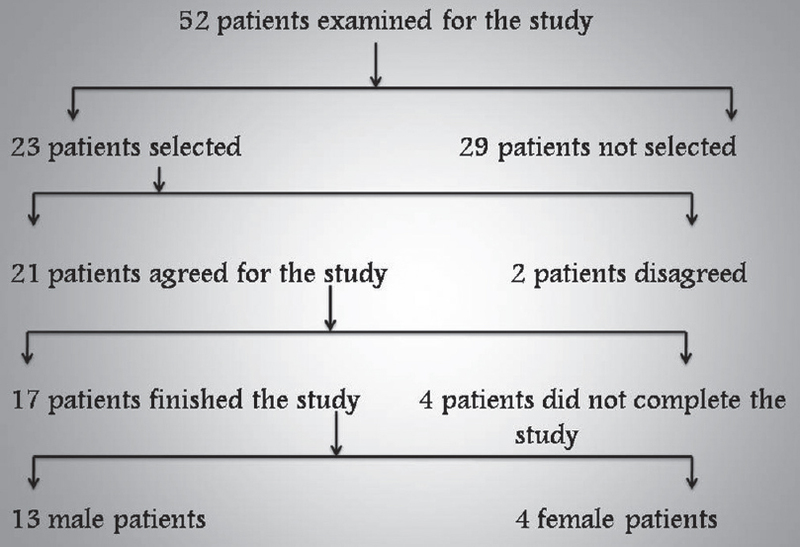 Of all the 17 patients selected for the study, the mean age distribution in both groups irrespective of the gender was found to be between 35 and 40 years [Graph 1]. 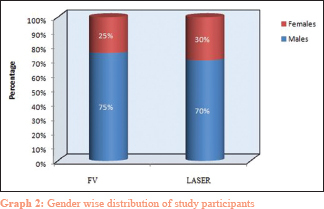 However, male participants are more in the study when compared to female participants [Graph 2]. At baseline, the mean score was 7.03 ± 1.22, followed by a gradual decrease in the mean by 15 days (6.20 ± 1.48), 1 month (5.95 ± 1.20), and 2 months (5.63 ± 1.32). The difference found from baseline to 2 months was statistically significant [Graph 3]. At baseline, the mean score was 7.53 ± 1.13, followed by a gradual decrease in the mean by 15 days (6.20 ± 1.41), 1 month (5.68 ± 1.29), and 2 months (4.48 ± 1.14). The difference found from baseline to 2 months was statistically significant [Graph 3]. INFERENCE: There was no significant difference in the mean values of TS of two groups (FV and DL) at baseline level. However, there was a gradual decrease in the mean values of TS of these groups by the end of 15, 30, and 60 days and this difference found was highly significant. At baseline, the mean score was 7.55 ± 1.00, followed by a gradual decrease in the mean by 15 days (6.73 ± 1.30), 1 month (6.45 ± 1.22), and 2 months (6.98 ± 0.99). The difference found from baseline to 2 months was statistically significant [Graph 4]. At baseline, the mean score was 8.10 ± 1.32, followed by a gradual decrease in the mean by 15 days (6.75 ± 0.88), 1 month (5.38 ± 0.90), and 2 months (3.85 ± 0.81). The difference found from baseline to 2 months was statistically significant [Graph 4]. INFERENCE: There was no significant difference in the mean values of air blast of two groups (FV and DL) at baseline level. However, there was a gradual decrease in the mean values by the end of 15, 30, and 60 days and this difference found was highly significant. At baseline, 15 and 30 days, there was no significant mean difference found between the groups: FV and DL, P = 0.19, 1.00, and 0.49, respectively. After 60 days, significant results were seen in comparison with both the groups, P = 0.005 [Table 1] and [Graph 5]. 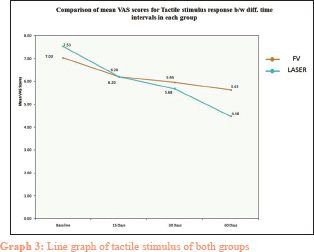 INFERENCE: By the end of 2 months, Laser group showed a better reduction in TS compared to FV group. At baseline level and 15 days, there was no significant mean difference found between the groups: FV and DL, P = 0.15 and 0.94, respectively. After 30 days, significant results were seen in comparison with both groups, P = 0.003 and by the end of 2nd month highly significant results were seen with a P > 0.001 [Table 2] and [Graph 6]. INFERENCE: By the end of 2 months, Laser group showed better reduction in air blast stimulus compared to FV group. Using repeated measures ANOVA test at baseline, 15 days, 1 month, and 2 months, the TS and Air blast stimulation tests demonstrated a significant difference between groups and a significant difference over the 2-month study period. 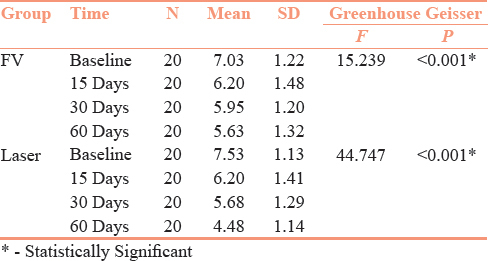 There was also a significant difference within the groups with time, indicating a superior performance of Laser group when compared to FV group [Table 3] and [Table 4]. DH is one of the most commonly encountered clinical problems. It is defined as the exaggerated sensitivity experienced by the patient to certain stimulus regardless of location (Buccal/lingual/palatal/occlusal)., The incidence of DH ranges from 4% to 74%, and this huge variation of incidence is due to the difference in populations and different methods of investigations. In the present study, most affected patients are in the age group of 20–50 years, with a peak between 30 and 40 years of age which is in accordance with the study done by Flynn et al. 1985 in the population of West of Scotland. Furthermore, in the present study, higher incidence of DH is reported in males than in females which is in contrary with the reports published by Sanjay Miglani et al. 2010 who reported a higher incidence of DH in females compared to males. A detailed history, clinical, radiographic examination, and questions asked by the professional are essential to conclude a definitive diagnosis of DH. 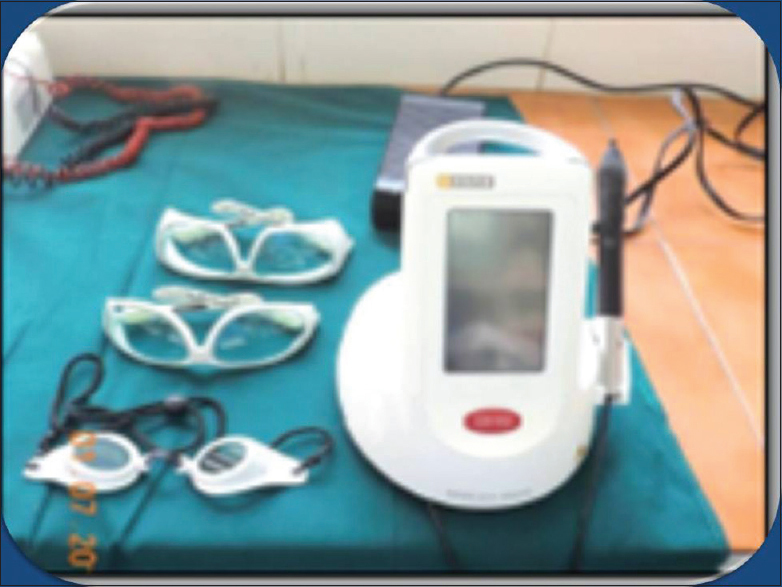 To elicit, DH TS and air blast stimulation were chosen in the present study as they are more practical way of diagnosing DH for a single tooth, inexpensive, easily available, and patient compliant. Many reports have suggested the similar association of symptoms between hypersensitive teeth and inflamed pulps (such as sensitivity to cold, air, and heat).,, Hence to rule out the pathology, in the present study, electric pulp vitality test was performed for every tooth. Although many treatment options were available for treating DH. Still, the most common and usually the first therapy is the usage of fluorides in the form of pastes, rinses, varnishes, etc. in reducing DH. In the present study, we used FV (Fluor protector by Ivoclar Vivadent) which was originally developed in 1975 by Arends and Schuthof. Our results demonstrated that a significant decrease in DH compared to baseline, a gradual decrease in TS, and air blast stimulation was observed at 15, 30, and 60 days that confirms the mechanism of action, that the deposition of fluoride on the tooth surface results in formation of fluoroapatite and this mineral has the ability to seal completely dental tubules and can promote formation of secondary dentin surface. This is in accordance with the studies done by Suge et al. in 2006 and 2008, who reported that fluoridated apatite, can form stable crystals that gets deposited deep inside the dentinal tubules and are resistant to removal from the action of saliva, brushing, or action of dietary substances. On the other hand, Corona et al. reported that the efficacy of FV decreases from 15 to 60 days during tooth brushing, which is in contrary to the present study. 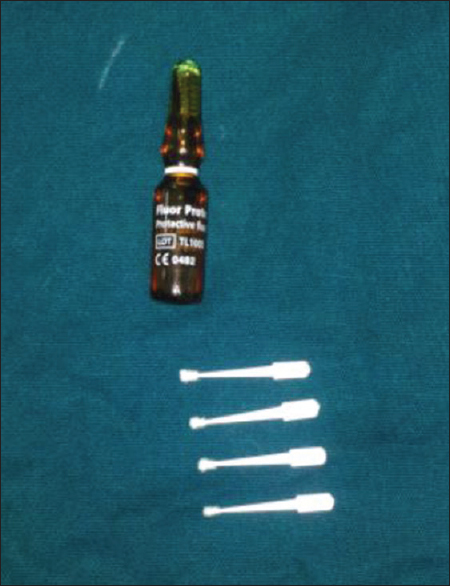 Laser, as a treatment modality for DH, is introduced in 1985. Since then, many reports have been published regarding the efficacy of lasers in treating DH. Yttrium Aluminum Garnet (Nd: YAG, Er: YAG lasers) and Erbium, Chromium doped: Yttrium, Scandium, Gallium, and Garnet (Er, Cr: YSGG) lasers). According to the reports published by Asnaashari et al. and Aranha et al., Low-power laser therapy for DH is an appropriate treatment strategy to promote biomodulatory effects, minimizes pain, and reduce inflammatory processes, which made us choose Low output power DL for the study. DL used was with a wavelength of 810 nm with 0.5 W output power which is in accordance with the study done by Mittal et al., who also used the same parameters of DL in treating DH and observed a significant reduction in DH without any side effects. Using this laser, DH when compared to baseline, a gradual decrease in TS and air blast stimulation was observed at 15, 30, and 60 days. This is in accordance with a study by Matsumoto et al. who observed 85% improvement in DH. Kumazaki et al. showed an improvement of 69.2% in the group treated with laser compared to placebo group and Yamaguchi et al. observed an effective improvement of 60% of DH in the group treated with laser compared to nonlased group. When compared between the laser group and fluoride group, laser group showed superior reduction in TS and air blast stimulation after 30 and 60 days which is in accordance with the study done by Corona et al. who reported improvement in group treated with laser after 30 days when compared to fluoride group. Also Aranha et al. reported improved results in DH when low-intensity laser therapy was used in comparison with fluoride group. Longer observation time is required to confirm the results. The study concluded that the use of 810 nm DL with 0.5 W output power resulted in significant reduction in the severity of DH compared to flour protector FV. However, the therapeutic effect of this combination would have yielded better results than the application of laser alone or FV alone. Umberto R, Claudia R, Gaspare P, Gianluca T, Alessandro del V. Treatment of dentine hypersensitivity by diode laser: A clinical study. Int J Dent 2012;2012:858950. Hashim NT, Gasmalla BG, Sabahelkheir AH, Awooda AM. 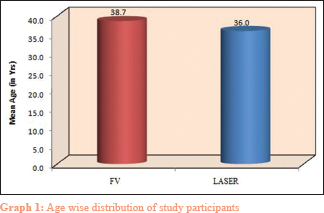 Effect of the clinical application of the diode laser (810 nm) in the treatment of dentine hypersensitivity. BMC Res Notes 2014;7:31. Paine ML, Slots J, Rich SK. Fluoride use in periodontal therapy: A review of the literature. J Am Dent Assoc 1998;129:69-77. Leonard RH Jr., Smith LR, Garland GE, Caplan DJ. Desensitizing agent efficacy during whitening in an at-risk population. J Esthet Restor Dent 2004;16:49-55. Orchardson R, Gangarosa LP, Holland GR, Pashley DH, Trowbridge HO, Ashley FP, et al. Dentine hypersensitivity—into the 21st century. Archives of oral biology. 1994;39:S113-9. Addy M. Tooth wear and sensitivity: Clinical advances in restorative dentistry. In: Addy M, Embery G, Edgar WM, Orchardson R, editors. Dentine Hypersensitivity: Definition, Prevalence Distribution and Aetiology. London: Martin Dunitz; 2000. p. 239-48. Rees JS, Jin LJ, Lam S, Kudanowska I, Vowles R. The prevalence of dentine hypersensitivity in a hospital clinic population in Hong Kong. J Dent 2003;31:453-61. Flynn J, Galloway R, Orchardson R. The incidence of hypersensitive teeth in the West of Scotland. J Dent 1985;13:230-6. Addy M. Dentine hypersensitivity: New perspectives on an old problem. International Dental J 2002;52(S5P2):367-75. Rapp R, Avery JK, Recoter RA. A study of the distribution of nerves in human teeth. J Can Dent Assoc 1957;23:447-53. West NX, Lussi A, Seong J, Hellwig E. Dentin hypersensitivity: Pain mechanisms and aetiology of exposed cervical dentin. Clin Oral Investig 2013;17 Suppl 1:S9-19. Nardi GM, Sabatini S, Lauritano D, Silvestre F, Petruzzi M. Effectiveness of two different desensitizing varnishes in reducing tooth sensitivity: A randomized double-blind clinical trial. Oral Implantol (Rome) 2016;9:185-9. Suge T, Kawasaki A, Ishikawa K, Matsuo T, Ebisu S. Effect of ammonium hexafluorosilicate on dentin tubule occlusion for the treatment of dentin hypersensitivity. Am J Dent 2006;19:248-52. Suge T, Kawasaki A, Ishikawa K, Matsuo T, Ebisu S. Ammonium hexafluorosilicate elicits calcium phosphate precipitation and shows continuous dentin tubule occlusion. Dent Mater 2008;24:192-8. Aranha AC, Eduardo Cde P. Effects of Er: YAG and Er, Cr: YSGG lasers on dentine hypersensitivity. Short-term clinical evaluation. Lasers Med Sci 2012;27:813-8. Mittal R, Singla MG, Sood A, Dua A, Sodhi PS. Clinical evaluation of middle power output 810 nm GaAIAs diode laser for treating severe dentin hypersensitivity: A randomized clinical trial. Int J Laser Dent 2014;4:20-5. Matsumoto K, Funai H, Wakabayashi H. Study on the treatment of hypersensitive dentine by GaAIAs laser diode. J Conserv Dent 1985;28:766-71. Kumazaki M, Zennyu K, Inoue M, Fujii B. 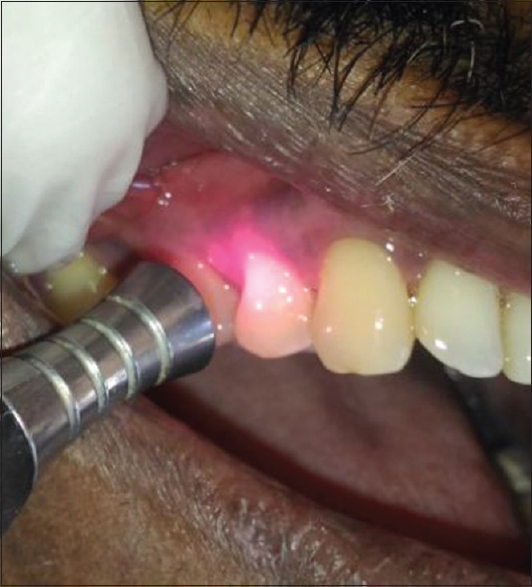 Clinical evaluation of GaAlAs-semiconductor laser in the treatment of hypersensitive dentin. J Conserv Dent 1990;33:911-8.